Modern children’s room acts less as a simple bedchamber. It is a versatile space that accommodates a study, hobby and even a play area. It can become a refuge of a sort for your kids as well. 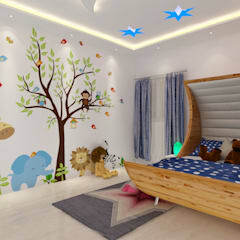 A tastefully designed modern nursery undoubtedly improves the aesthetic value of your home. More importantly, it provides the right kind of the interior environment that is conducive to a kid’s growth and well being. 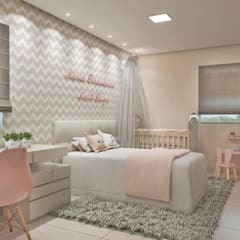 Planning for a modern nursery is one of the most pleasurable experiences of the parents to keenly look forward to. 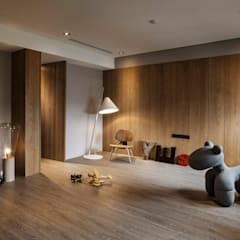 Designing a modern nursery can turn out to be a more complex task than you were inclined to believe in the first place. However, that has not deterred anyone from designing a modern nursery or renovating an old one. There is no reason for you to feel intimidated by the minor challenges that you may encounter on the way. We have plenty of children’s room ideas for you to take inspirations from. 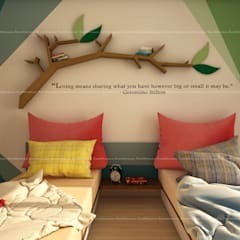 Our regular tips and tricks about modern children’s room would also help you to design a charming space for your little ones. 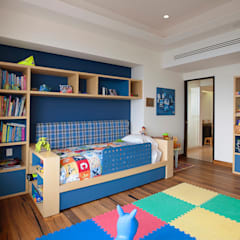 Identify the space you want to convert into a modern kid’s room, but do not attempt to decorate the space right away. Make sure you have made the area sufficiently child friendly before thinking of the décor. Secure the windows and open balconies with grilles, net or sturdy wall panels. Some of these may not be too pleasing to the eyes, but you will have to make such compromises for your children’s safety. Electrical cords lying loose must be fixed first. Lighting fixtures and features like switchboard should be kept out of the reach. No sharp objects or nails should be mounted on the walls or in any particular area of the room. Items like plastic bags, strings etc that can cause choking hazards or strangulation must be kept locked in the drawers. If you are planning this space for a toddler, it would be better not to have indoor garden or potted plants in this area, especially if they have stone chips and gravel as decorations. Poisonous or harmful chemicals, detergents etc should be kept in the storeroom or utility room. Remove the locking facilities from the doors and windows or use only child safe locks. Be very careful to maintain a clean and hygienic modern kid’s bedroom. Toys and other decorative features bought for this space should be non toxic. Shy away from placing glass objects in this space. Do not keep heavy items on top of the storage units or on the shelves mounted high on the walls. They may fall and cause accidental injuries. It would also be better to keep away tvs and other electronic gadgets from a modern baby room until your children are old enough to handle them responsibly. You must also take adequate safety measures in other areas of your home frequented by your kid. Pay special attention to your kitchen and dining room. Keep cutlery, porcelain pieces and small appliances out of a kid’s reach. Staircases without railings can pose a danger too. As you already know, you cannot really afford to relax close supervision until your children are old enough to understand the dangers associated with the objects mentioned above. A variety of flooring option is now open in front of you. 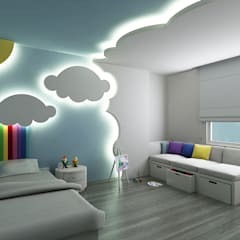 You may check our modern kid’s room ideas and select the option that seems most appropriate for this space. Natural hardwood flooring is warm, comfortable for the feet, healthy and eco friendly. It is very durable and perfect for a kid’s room. Its anti slip properties make it all the more suited for a modern nursery. 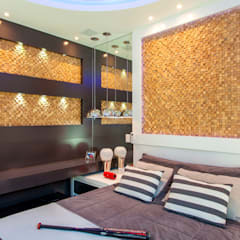 Due to its softness and natural warmth cork flooring can be a good option as well. The cushioned nature of the cork flooring will minimise the chances of injuries caused by accidental falls. Ceramic and porcelain tiles are available in a range of colours and very cheerful motifs. Installing them would help to build a more spirited atmosphere suitable for a children’s space. Though extremely durable, stone can be hard and cold. For better comfort, it would be better to cover it with area rugs. Though the popularity of wall to wall carpeting has gone down over the years, it is still one of the best flooring option for a contemporary kid’s room. Its softness and anti slip property address a major concern about child safety within the four walls of your home. It remains warm in harsh winter months and cool in the summer months. It gives insulation and acoustical benefits as well. It is available in a number of style, textures and designs. This naturally gives you an added opportunity to spice up the interior of a modern nursery. Natural wool carpet certainly scores over its cheaper synthetic counterparts. However, you will have to be very diligent over cleaning the carpet if you want to maintain a clean and allergen free interior environment. Choosing the right colour scheme for any room is important, more so for this space where the long term impact of the same can aid or hamper the full flourish of a child’s mind. While there is no rule regarding choosing the right shades and wall décor, it is better to select a scheme that suits your kid’s personality. If your child has an opinion about his or her preferred colour scheme it would be better to pay heed to that. A chaotic colour scheme dominated by a number of bright shades is never considered suitable for a children’s room. 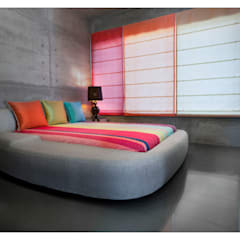 Remember, this space is meant for resting also, so vibrant shades should be suitably toned down to give a soothing effect. 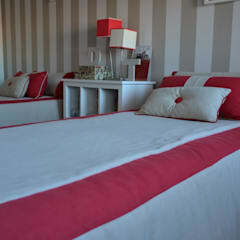 It is common to choose a soft rosy shade for a modern girl’s room and blue tints for a modern boy’s bedroom. 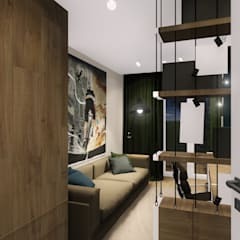 However, there is no harm is experimenting with some other tones and plan a more offbeat but appealing scheme for this room. 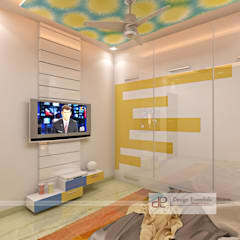 Spring colours and pastel shades can be introduced in this space too. Select such tones that do not have a gloomy effect on the ambience and does not induce a depressive mood. Be careful about the wall décor as well. You may use wallpaper to cover the feature wall. Fabric walling would have insulation benefits. Encourage your children to come up with possible décor ideas. Ask them to paint beautiful sceneries or capture photographs in the backyard which can be framed and put up on the wall. This way you will help them to explore their creative faculties. You may paint a part of the wall with chalkboard paints. They are now available in a number of shades beyond the regular black and green. Surely, they will much appreciate such ingenuous additions to their room as these. Due to its sheer variety, selecting appropriate modern kid’s furniture could prove to be a slightly daunting task. Buy only those items that are long lasting, do not contain any sharp edges, would not cause any allergic reaction and are stylish. Modern baby furniture made of high quality wood is generally considered the safest and most elegant option. A comfortable crib and dresser would be sufficient for an infant’s room. But for slightly grown up children the requirements will be a little more varied. It would be better to buy children’s furniture that can be used for long. 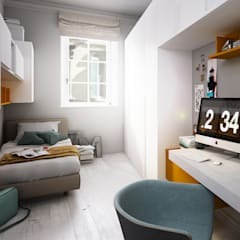 So, apart from their sturdiness and quality, you will have to keep an eye on the size of the bed, wardrobes and so on. Choosing the right kind of modern baby bedding is vital for the well being of your little one. You may buy bedding items separately or in a set with matching mattress, sheets and quilts. Quality cotton sheets do not cause any allergies and are easy to maintain. Fleece and flannel and preferred for their snug nature. Modern girl’s furniture can be distinguished by their delicate design. Unless this is meant to be a surprise for your child, take her into confidence or let her accompany you during your shopping trip. This will help to choose articles according to her preferences and personalise her space in style. Be very insistent on the comfort factor and do not opt for flashy styles. Make sure the study table and chairs are of comfortable height so that she does not need to stretch her back or strain her eyes. The same applies to modern boy’s furniture. Do not clutter the room with too many objects of décor. As a storage solution, built in shelves work better than freestanding wardrobes. Stools and benches with storage will help you to keep the dolls and other playthings neatly organised. While choosing the various pieces of furniture for your modern nursery, keep in mind the overall colour scheme. Induce a dash of colour, but never overdo it. Try to maintain an organised room which would help to keep the space airy and elegant.